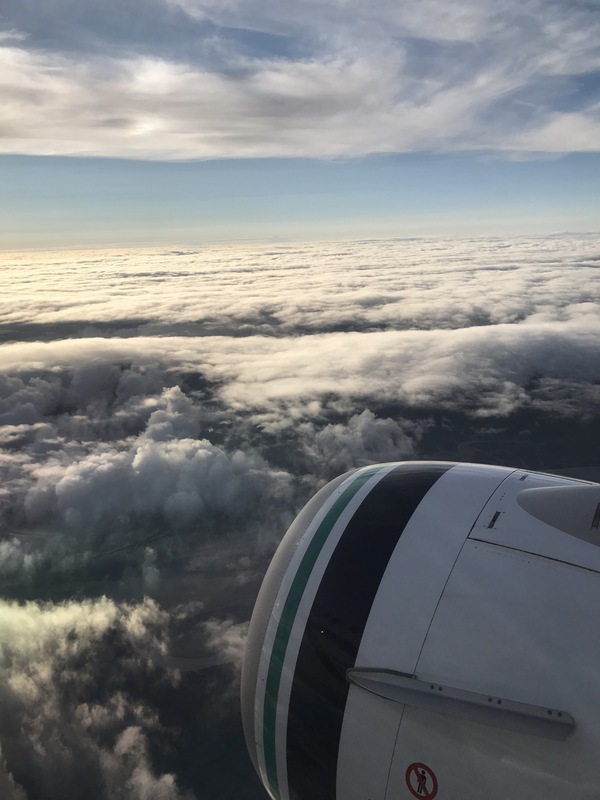 I went to Denali National Park (to be continued next post) but I didn’t write about the pre-journey! After missing the first bus because there was no room for the stroller (even though I offered to fold it up and it’s compact the driver wouldn’t let me on) we went to downtown Seattle to get in the Link Light Rail. I was thankful for the brakes that kept us from rolling around and having her strapped in on the not-so-smooth ride. 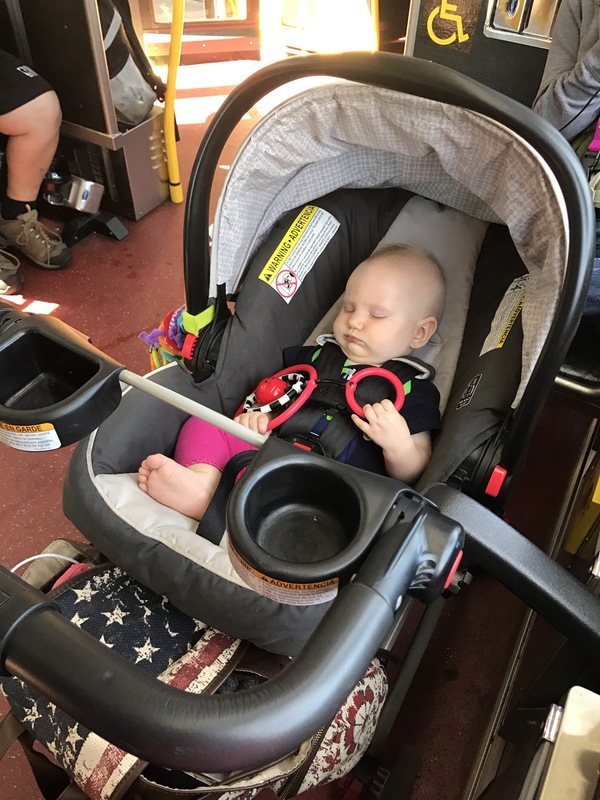 Kaya took her first bus ride like a champ. She was a little wide eyed by the motion and noise but got used to it quickly and fell asleep. I’ve been to West Lake Station multiple times before but never with a stroller. 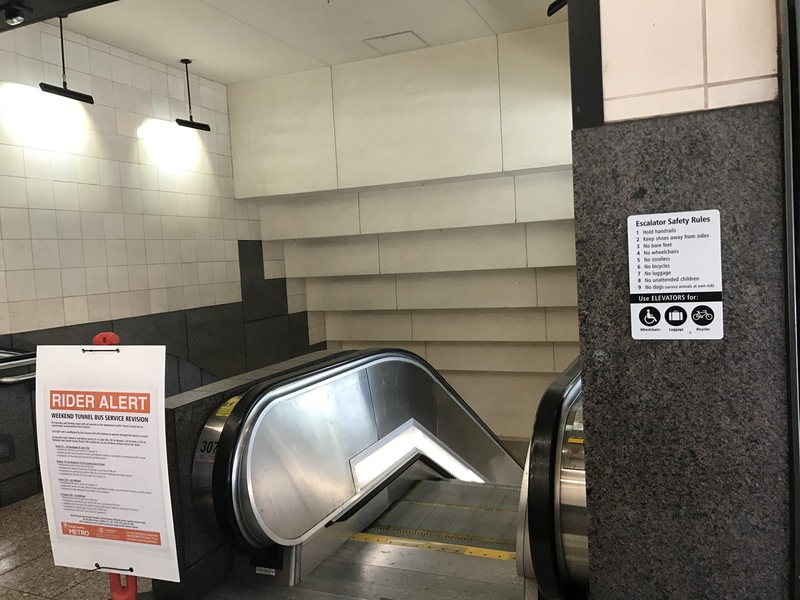 The escalators are easy to find but despite the sign suggesting I take the elevator (which I was planning on…) it took me a couple minutes to find it down the street tucked into a corner that was obviously used as an emergency bathroom by the smell. The elevators in the station were much cleaner smelling, but no easier to find (there were signs for everything but them). Just to go along with the minor mishaps of the morning my only credit card (I lost my wallet at a restaurant the week before and that’s the one that arrived in the mail before I left) didn’t work on the machine for some reason but thankfully I’d brought some emergency travel money (all $5 of it! Alex had our actual travel money in his bag). On the light rail I was glad for the sturdy protection of the car seat, even in the stroller, since it was so packed someone wasn’t able to find something to hold onto and fell into the car seat. Another woman, an acupuncturist, with a carrier holding her 6 month old, stood beside me in the corner to try to avoid getting hit as well. 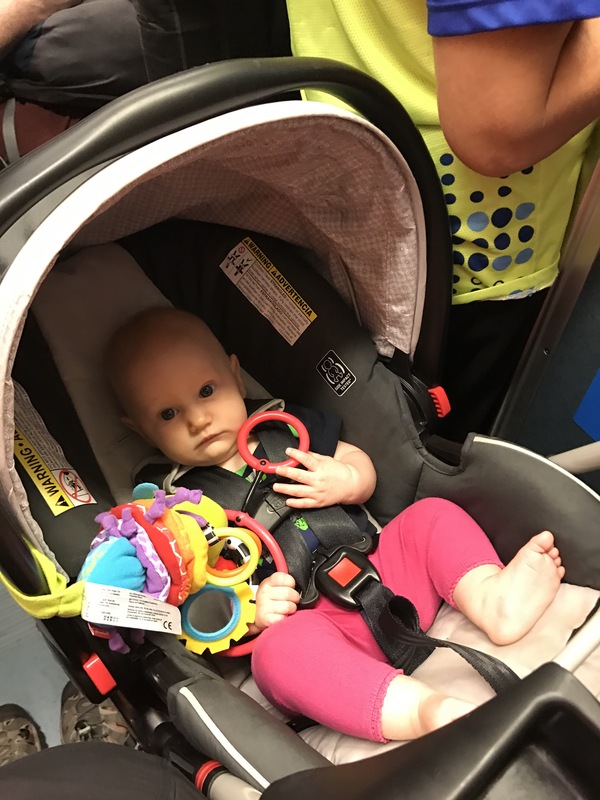 As we stood, crammed into the wheelchair isle, she was offered a seat several times (it was obvious I couldn’t fit anywhere else with the stroller) but declined. We bonded over how difficult it is to sit with the child carrier on (baby legs meet mommy thighs) and how difficult it had been to stand on a moving bus the first three months of pregnancy when nausea and fatigue is highest and you don’t look pregnant so no one offers a seat to the 20-something year old. We also talked, of course, about how nice and helpful people were later in pregnancy and now that we have babies. One of the friendly people I met was on the way off the light rail, at the airport. She was a spirited special-education teacher who hung around after getting off the elevator in order to get a smile from the baby. The stony faced people on the light rail, all involved in very interesting things on their cell phones, found themselves responding to Kaya’s contagious smile’s. Vacation hadn’t even started and I already felt I was on a mini adventure. 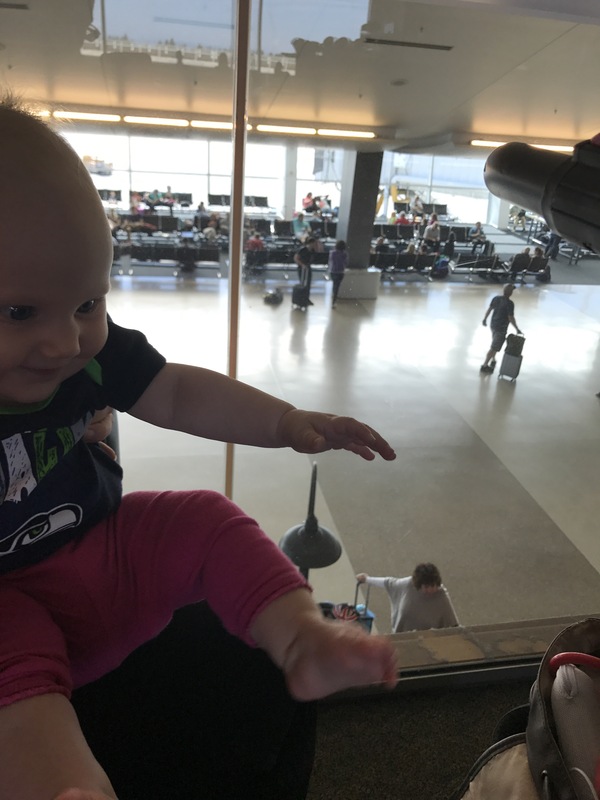 Alex met us at the airport from work and we made it through security fine (I highly recommend pre-check with a baby so you don’t have to struggle with shoes, toiletries, and laptops, while also juggling the extra gear and wiggly baby. We also had another luxury I highly recommend with kids: access to a club. I’d never heard of the airport clubs before my older brother (who flies frequently for work) told me about them. 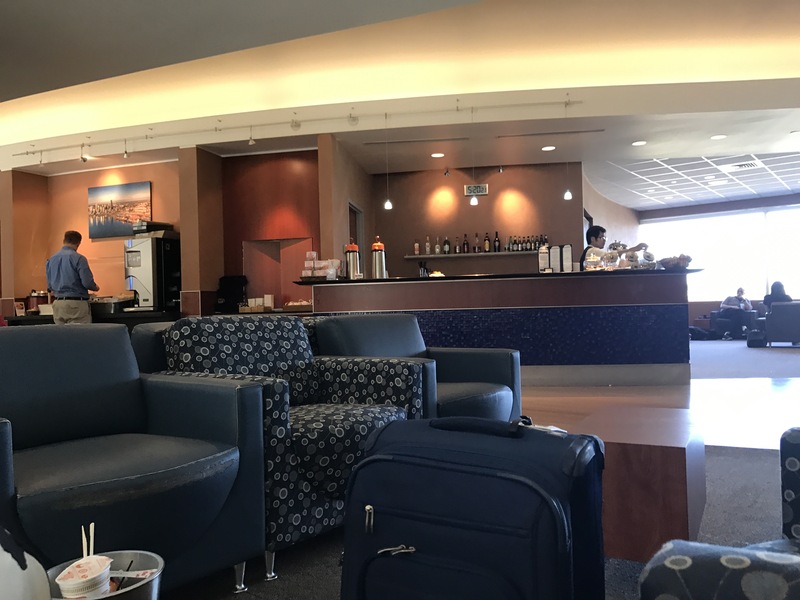 I dismissed it as a luxurious non-essential until we had an 8 hour layover on our way to Memphis and were able to get into Delta Club with my parents (also very frequent flyers). It was amazing! I still won’t call it an essential… but it makes life so much better. And these luxury clubs are actually not as expensive as you might think! We got a pass with a credit card that has a $450 annual fee, but since you can have multiple card holders you can say…split that with your brothers. Plus there are other perks on the card, like $100 back when buying airline tickets with it, that also add up if you’re purchasing tickets. AND on some (most?) of those cards you can get the TSA pre-check thing for free that’s another (almost) essential. There’s space to spread out (even if the seats were full at least they’re real chairs unlike the chairs squished into the boarding area), included snacks and drinks (alcoholic and non-alcoholic), and it’s just a more relaxed atmosphere. 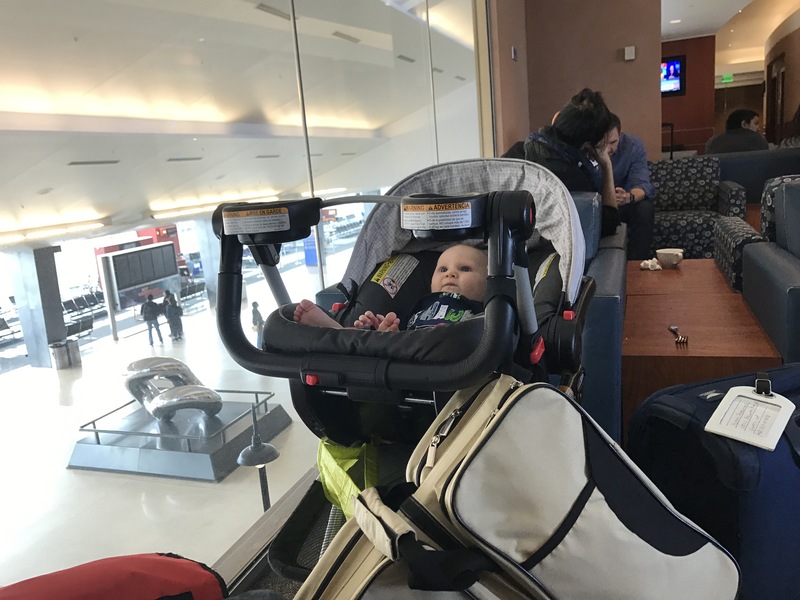 It also provides us some incentive to allow for extra time (a must when traveling with kids) because the earlier you get to the airport the more time you have to eat and drink! And of course the less stressed out you are. We landed in Anchorage and my family picked us up and drove us to Big Lake in a rickety 13 passenger van to fit all seven of us (our rig for a long road trip to Denali National Park). This first leg of the trip was under two hours (we already saw three moose, including two babies! ), all in daylight thanks to the land of the midnight sun. Continue along the park to the end of the road.